When asked what type of training is most effective for soft skills training in areas such as communication, management, and leadership, more than 80 percent of respondents to an American Management Association survey at the Training 2015 Conference & Expo stated that classroom training, including corporate and open-enrollment instructor-led training, was more effective than virtual training. (http://bit.ly/1C8n0SB), more than 80 percent of respondents stated that classroom training was more effective than virtual training. Attendees further cited a trend toward blended training, with classroom learning bookended by virtual instruction. When asked to identify the most effective type of training for technical skills, such as project management, finance, sales, marketing, analytics, and HR training, some 57 percent of respondents thought classroom training was more effective compared to 43 percent who favored virtual training. Training professionals next were asked to select one or more metrics they use to measure training effectiveness. Employee feedback (used by 73 percent) is by far the dominant mechanism. Other forms of opinion-based metrics include manager evaluations (used by 40 percent) and 360-degree feedback (used by 31 percent). Only half of the respondents obtain measurable performance results. 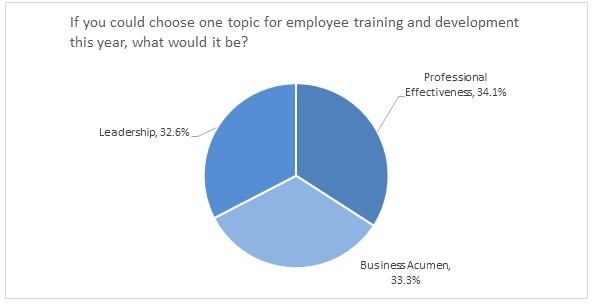 An open-ended question was asked to gain insight into respondents’ most significant unmet training topic need in one of three categories: business acumen, leadership, and professional effectiveness (answers were grouped using the competency model in AMA’s Talent Transformation Tool, http://amatalenttool.com). The most common topics stated relating to business acumen include (in descending order of priority): sales, IT, customer service, and project management. The most common topics stated relating to leadership include coaching and influence/ persuasion. The most common topics stated relating to professional effectiveness include collaboration (tie), Emotional Intelligence (tie), and verbal communication.